298 pages | 20 B/W Illus. Interest in the field of neurodevelopmental disorders has grown exponentially in recent years across a range of disciplines, including psychology, psychiatry, education and neuroscience. The research itself has become more sophisticated, using multidisciplinary methods to probe interdisciplinary questions. 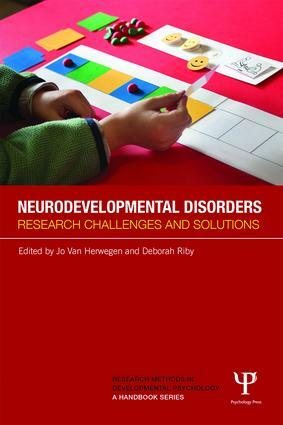 Neurodevelopmental Disorders: Research Challenges and Solutions provides a thorough overview of the key issues involved in researching neurodevelopmental disorders. The volume includes 14 chapters, arranged over three sections. Chapters in the first section address general research challenges for the study of neurodevelopmental disorders. The second section draws upon specific disorders (such as Williams syndrome, Autism Spectrum Disorders, Down Syndrome, Fragile X Syndrome, ADHD, and Language Disorders) to consider the syndrome-specific issues or challenges that may be crucial to advancing our understanding of aspects of cognition and behavior associated with them. The final section considers how research evidence may be translated into practice to begin making an impact upon the lives of individuals who have neurodevelopmental disorders and their families. Each chapter in the book also includes ‘practical tips’ for either conducting research with individuals who have neurodevelopmental disorders or considering wider practical issues. The book will be indispensable reading for advanced students, researchers, and practitioners in the fields of developmental psychology, developmental psychopathology, special needs education, neuropsychology, and neurodevelopmental disorders. Jo Van Herwegen is a Senior Lecturer in the Department of Psychology at Kingston University, UK. She is co-ordinator of the Child Development and Learning Difficulties Unit. Her research focuses on language and number development in both typical and atypical populations, including Williams syndrome, Autism Spectrum Disorders, Down syndrome, and Specific Language Impairment. Deborah Riby is a Senior Lecturer in the Department of Psychology at Durham University, UK and is an Honorary lecturer at Monash University, Melbourne, Australia. She is co-ordinator of the Developmental Psychology Research Group and head of the North East Williams Syndrome Research Group. Her research focuses on syndrome-specific signatures of cognition and behaviour, primarily focusing on the developmental disorders Williams syndrome and Autism.